I love early mornings, and this past Monday at Quail Hollow Club sure was one of the best. The ringing of my iPhone alarm clamored well before the rising sun, but after a mere 5 hours of sleep I instantly considered snoozing for a few more. 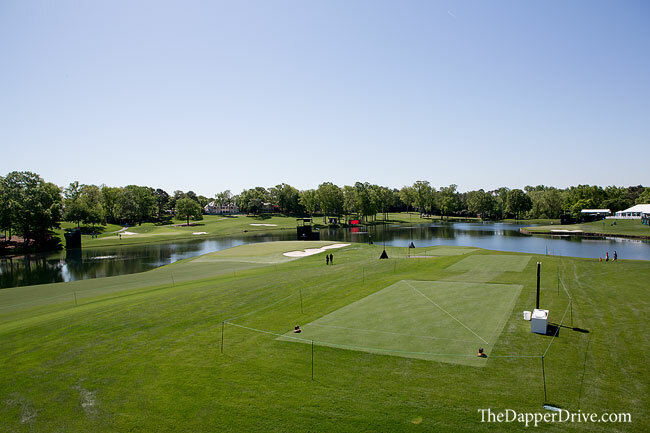 After all, it was just day one of the Wells Fargo Championship, with plenty of golf spectating to come. Despite the temptation, I felt the golf universe’s pull … get up already. Within minutes of my arrival at the Quail Hollow, I couldn’t have been more glad I did. The near-empty bus ride from off-site parking to the golf course should have tipped me off on what was to come. A usual shoulder-to-shoulder herding through the entrance was swapped for a brisk solo walk inside the main gate. Concessions were still closed down, just beginning the process of opening for the week. Practice facilities eerily empty and usually bustling fairways nearly extinct. 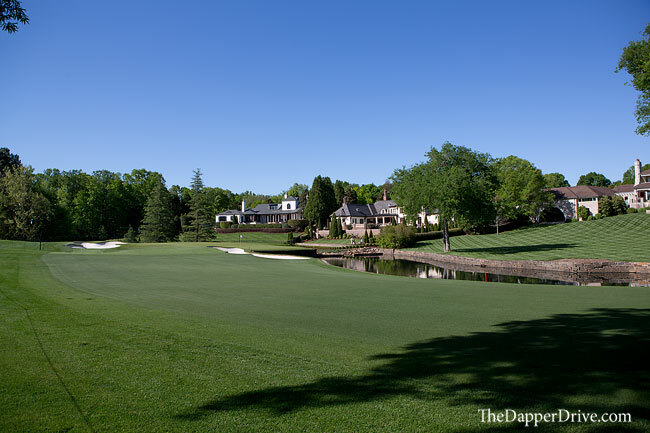 Initial concern was quickly replaced by an embrace of this rare experience as I set out to walk a perfectly manicured – and nearly deserted – golf course, trusty camera in hand. Strolling just outside the ropes on the daunting 520 yard par 4 opener, the sun’s radiant rise above the treetops and distant hum of a grounds-crew hard at work offered the only distraction on this crisp spring morning. Long shadows danced along the pristine fairways, where a thin layer of dew had just recently been mown away. Turning at the dogleg to survey the view back toward the tee, a faint silhouette appeared, marching aggressively toward me from that very same tee. The fit build and royal blue NY Giants hat confirmed my initial suspicion — it was Joe Lacava (Tiger’s caddy) out completing some pre-tournament prep. The next hour turned out to be one amazing experience. I walked “alongside” Joey (outside the ropes), stalking his every move. What landing areas was he looking at? Which bunkers and hazards seemed a concern? How precisely was he dissecting the greens? Did he jot down endless notes? Questions ran rampant through my mind. That one hour took us through 5 holes, showing just how detailed his preparation was for his man. And while I was tempted to engage in conversation, I I respected his task. No conversations, but a quick head nod to me signified his appreciation for space to perform his job at hand. That’s my read anyway. I scurried ahead to find my first player sighting — Ross Fisher out for a (very) early morning round. I stood nearby, watching him skip pitch shots and splash bunker shots on the 6th green (a 240+ yard par 3 means prepping for a few missed greens throughout the week — even for the best in the world). We continued onto the 7th (one of my favorite holes at Quail), where he made Driver-hybrid onto this tightly guarded par 5 green look far too easy, before rolling a matrix of difficult putts from every conceivable angle. As I wandered onward, I made an extra effort to notice the little things. The morning light was still just right, sounds of chirping birds had come alive, and I felt a bit like Chubbs — Happy Gilmore’s golf-loving protege — walking these dreamy grounds. For those who truly love this game, you can relate. 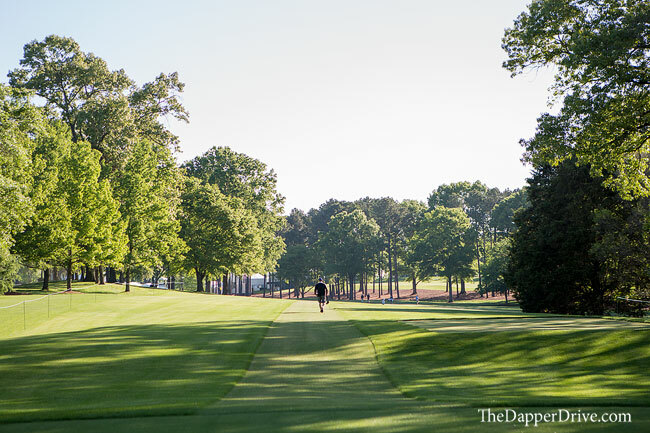 The beauty of a morning can be felt on any golf course, let alone the specimen that is Quail Hollow. 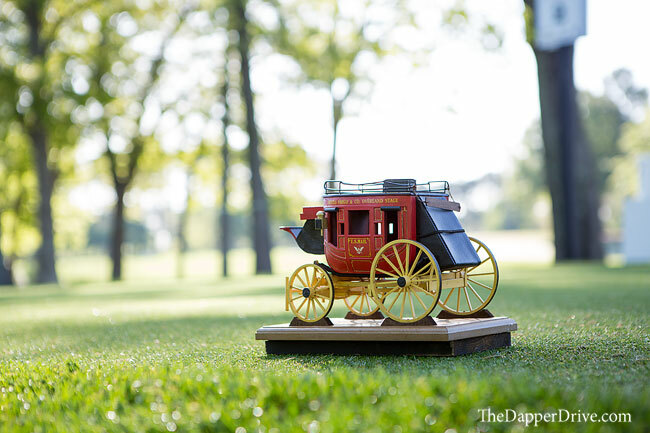 Towering trees make for memorable sights, while the Wells Fargo wagon-themed tee boxes are something to be seen. Catching wind of a few more players on the course, I booked it for the famed Green Mile — the stretch of closing holes that are so long, they actually span a mile. 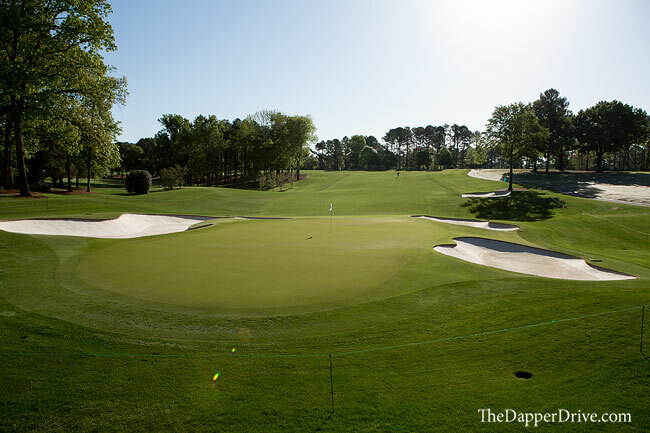 No finish is quite as demanding or visually stunning as the closing holes at Quail Hollow. My arrival behind the 15th green found me climbing into the “reserved” bleachers in search of a better camera angle. Empty today, but no doubt bustling in a few days time. My departure found me face-to-face with Alex Noren, who’s friendly demeanor showed in his quip — “Well, did you get the shot?” — and his unexpected willingness to share a brief chat. Nice guy, who I’ll find myself pulling for, no doubt (funny how that works, isn’t it?). 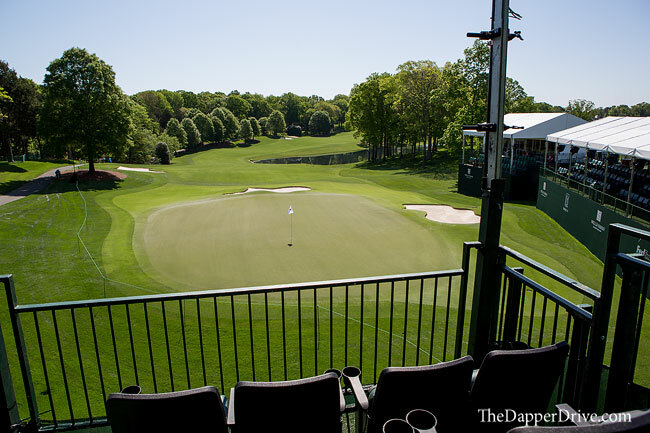 From the 15th, I made my way to the grandstands (also “reserved”) behind the 17th tee, arguably the best spot in the house. From this coveted location, you’ll see action on holes 16 & 17 in the foreground, along with the 14th green just across the water. 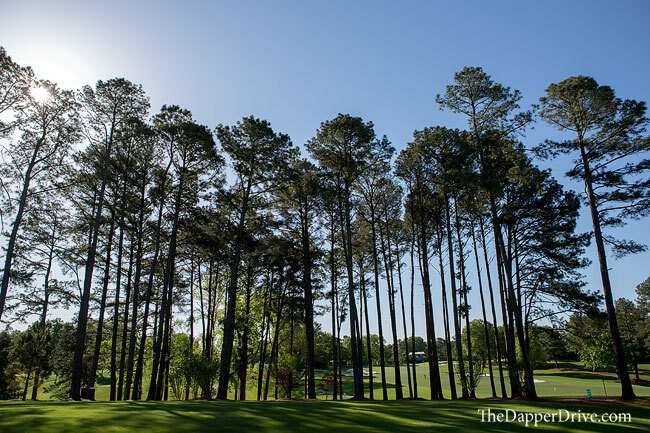 Even if you don’t find yourself with access, stand beside 17 tee for quite the viewing spot. 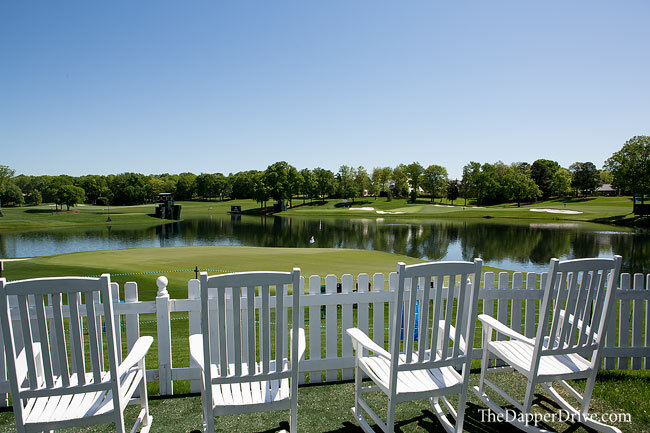 Or, bring a chair and secure a spot behind 17 green for an equally impressive setup. Even with no players to watch, I couldn’t help but spend 20 minutes basking in the morning sun while enjoying the view. As the 11am Monday Pro-Am was just getting underway, I headed toward an underrated part of the property to watch a few groups. Behind the 11th tee is a great spot to watch guys hit approaches (and putt) on the par 5 10th, while having an up-close look at ripped drives on 11. And, the 12th green and 13th tee are a mere 20 yards away. After watching a few Tour rookies make their way through, I popped over to the par 3 13th tee. My arrival was met by a player signing and giving his ball to a young girl following along. To say her and her father were excited wouldn’t be doing the moment justice. Minutes later, that very same player struck a high, towering draw that landed 10 feet short of the cup, took a hop forward, and nestled in the bottom of the cup. Perhaps “just another” hole in one on the PGA Tour, but for that girl and her father, undoubtably an unforgettable experience they’ll relive forever. 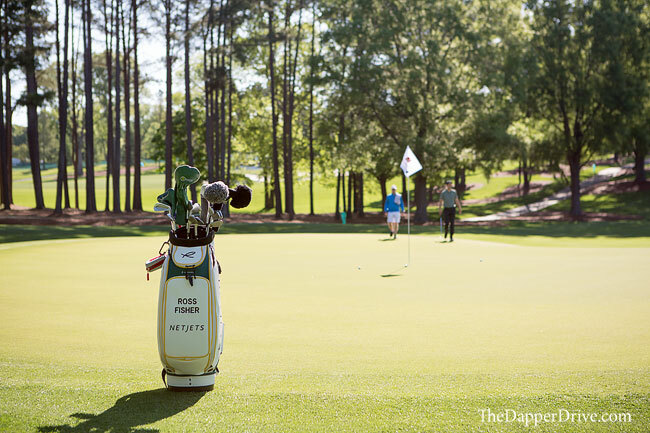 As I made my exit shortly before noon, crowds began to normalize as players took the course. Once desolate concessions bustled and the practice greens and driving range were now full. The action for the week seemed to finally be underway. 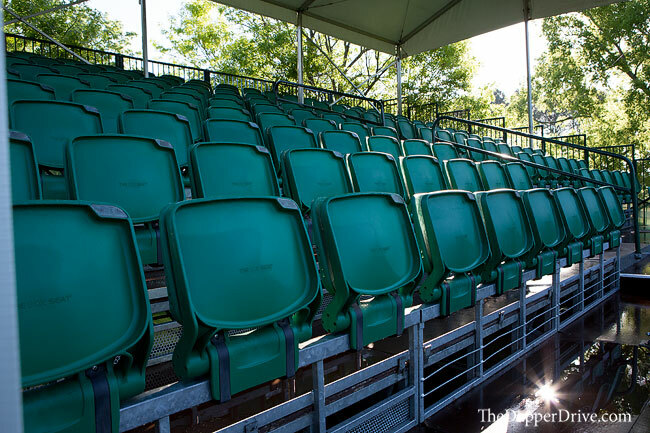 The PGA Tour after all, is all about the player-fan experience. 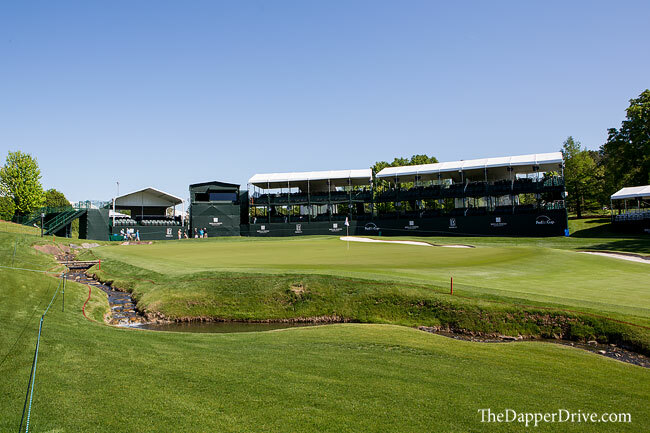 I too am super excited to watch the best in the world tee it up this week at Quail Hollow, and love the vibrant atmosphere the weekend at the Wells Fargo Championship brings. But as I found out on this Monday morning, when the fans are sleeping and the players yet to begin their weekly grind, there’s an ethereal golf experience to be had. All it takes, is an early morning rise. Read more about our golf experiences at courses around North America here.